Toronto, ON – 31 March 2016 – This spring, Family Channel takes viewers on a journey between two worlds with the premiere of the fantastical new series The Other Kingdom. The live-action comedy follows Astral, a fairy princess from the enchanted land of Athenia, who is torn between her rightful duty as heir to the throne and living the life of an everyday teenager in the mortal world. Created and executive produced by Thomas W. Lynch (Make It Pop), with Steven DeNure and Anne Loi also serving as executive producers, the series was filmed and produced at DHX Studios in Toronto. Bringing a dose of magic to Family Channel’s must-see Friday Night lineup, the series debuts with two back-to-back episodes on April 22 at 6 p.m. ET/PT. The Other Kingdom is ushered in by the 2003 rendition of the fairytale flick Peter Pan at 4 p.m. ET/PT and immediately followed by new episodes of fan-favourite series Backstage and The Next Step. 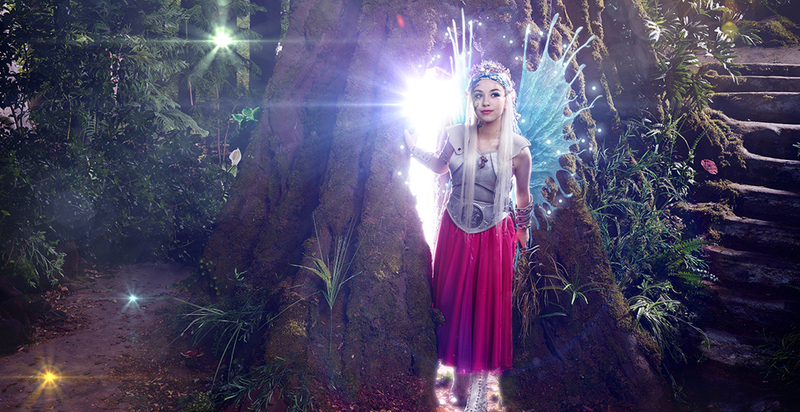 Esther Zynn stars as Fairy Princess Astral in The Other Kingdom, premiering April 22 on Family. Get a first look here; for artwork and series information, please visit http://press.family.ca. For 14-year-old fairy princess, Astral (Esther Zynn), living amongst the humans has always been her dream. So when she is given the chance to invoke her birthright and transform into an ”Other” for 90 days, she jumps at the opportunity. Posing as an exchange student, Astral enrolls in high school where she befriends quirky outcasts Morgan and Devon, develops a crush on the cute Tristan and butts heads with ambitious go-getter Hailey. But, Astral faces a ticking clock and a stark choice as she uncovers an evil plot that threatens her homeland – she will have to choose between staying in the new world she’s become enchanted by and protecting her kingdom before time runs out. Following the premiere, Family will air two new consecutive episodes of The Other Kingdom Fridays beginning at 6 p.m. ET/PT. Episodes of The Other Kingdom will be offered on Family OnDemand as they become available weekly beginning April 23. To learn more about the exciting new series, fans can fly over to Family.ca for show details, character bios and exclusive videos. Part of an epic night of fantasy and flight on Family, The Other Kingdom is preceded by the feature film Peter Pan at 4 p.m. ET/PT starring Jeremy Sumpter (Friday Night Lights) and Jason Isaacs (Harry Potter franchise). On a quiet street in London, a mysterious flying boy and his fairy sidekick Tinker Bell pay a visit to Wendy, John and Michael Darling, whisking them away on a magical adventure to Neverland. Then, at 7 p.m. ET/PT, viewers won’t want to miss a brand new episode of Backstage followed by The Next Step. The Other Kingdom stars Esther Zynn as Fairy Princess Astral; Stratford-native Callan Potter as Tristan, Astral’s crush; B.C.-raised Celina Martin as Astral’s newfound friend Morgan; Kingston, Ontario’s Taylor Adams as Devon, who hosts Astral on her student exchange; Richmond Hill’s Josette Halpert as overachiever Hailey; Brampton-born Adam J. Peddle as Astral’s half-troll cousin, Brendoni; and CJ Byrd-Vassell as British exchange student, Winston.